07/29/09 - A Texas CPA Invites Foreign-Born Instructors To Teach His State's "Gifted And Talented"
A partial solution to Haiti's crisis would be for the Dominican Republic to invest in it for the economic good of both countries. The border between the Dominican Republic and Haiti is porous and illegal immigration between the two countries cannot be controlled. I would therefore institute the practice of issuing national identity cards to foreigners including illegal aliens that they must always carry. Impose an annual renewal fee would help offset the cost of social services granted to Haitians and currently funded by Dominicans. Haitians are smart people but the majority are poor. A few elitist Haitian men hold all the power but are conflicted by contradictory and uncoordinated efforts by the nations that donate to it. I've been to Haiti and its capitol Port-au-Prince. 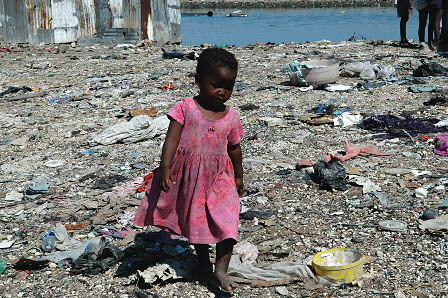 I've never seen worse living conditions, all caused by its corrupt and inept governance. Sievers is a financial executive in the leisure industry. He was born in California. A previous letter from Sievers regarding whether Puerto Ricans consider themselves American is here.